Based at North Cheam crossroads on the 213, 151 & 93 bus routes and situated between Worcester park and cheam train stations we are easily assessable. Parking is available in the cul de sac. Welcome to Leah's Little'uns childminding services. I am an Ofsted registered childminder. I understand that work commitments are hard so I will try and be as accommodating as I can when it comes to times. I am open full time with the exception of 4 weeks unpaid holiday. I also take time off over Christmas and New Year. I do not charge for my own holidays but charge 50% fee for any holiday taken by you for full time places. if you are a Term time only contracts: School holidays are not chargeable. All meals are Home Cooked. I hold a level 2 in catering and food hygiene.I accommodate allergies and personal requirements. I do ensure the children receive a healthy varied diet. I have a great variety of resources to support your child’s learning. Both Child led and adult initiated. For all children in the early years I follow the EYFS guidelines. Outdoor play is available all years round. The more puddles the better! I provide structured activities throughout the day and for wrap around school care. This include messy play, arts and crafts, an extremely large selection of toys that are rotated weekly, daily outings, parks, toddler groups, and libraries, the list is endless. I do also understand that older children may have homework and I will happily support them with this. I am also aware that they do appreciate some down time after school where they can chill and relax! All the children in my care are recognised as individuals and I thrive to ensure that their needs are met. I make a point of being able to work closely with parents to support both the child with any problems and the family. Each full time child will have a learning journey file showing evidence of their progress and achievements. I have a full clean driving license and provide suitable car seats from birth upwards. I have buggies, highchairs and travel cots. 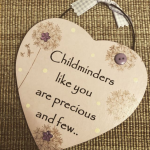 I’ve been an OFSTED registered childminder for 5 years having children from the age of from 6 months to 11 years. I have three children of my own and 4 stepchildren. We have Jenko our lovely Labrador that assists with outdoor play especially in Nonsuch Park, he ensures the children get enough exercise & dexter the cat who likes to play hide & seek !! I am always furthering my qualifications and training. Both Term time or full time contracts are available. We close for the Christmas period, 23rd December - 2nd January inclusive. Monies for outings may be requested. Statutory Public Holidays: Please note that Childminders are entitled to be paid in full for statutory public holidays, where these occur on a ‘usual’ minding day. Below are the latest reviews for Leahs littleuns. Please note that reviews represent the subjective opinions of other Childcare.co.uk users and not of Childcare.co.uk. Parents must carry out their own checks and references on childcare providers to ensure that they are completely happy before enaging in the use of their services. We engaged Leah's services when we first moved to London, my daughter was slightly anxious having not stayed with a stranger before, however after a few test run meeting suggested by Leah she was happy to be in her care. Leah went out of her way to ensure my daughter was comfortable and happy in her surroundings. The range of activities that Leah provided has to be commended as more often than not the kids were out and about, forest walks, trips to the beach, photos always provided of the trips and how much they were having a good time. For any Mum's and Dad's look for reassurance Leah's is more than capable and an extraordinary person. Leah cared for our two boys over a period of 3 years and I wouldn’t hesitate to recommend her as a childminder. Both of our boys settled incredibly well and within a short period of time which was entirely down to Leah’s calm and loving nature and the home from home environment she provides for the children in her care. My youngest suffered with recurrent bronchiolitis episodes from an early age and it was a real comfort at the time that Leah had specific training on asthma awareness and was fully aware of the symptoms and early signs of breathing issues in young children. Leah is an extremely motivated person – not only in terms of developing her own knowledge and skills but also in relation to the activities and resources she provides for the children. Leah's home is clean and tidy and she always has activities set up or trips organised for the children so they continually learn and experience new things. Leah is a warmhearted and open person who is incredibly adept at putting children (and adults) at ease. She is reliable and trustworthy and always tried to assist where she could when we needed to alter drop off or pick up times. Both of our boys developed in confidence and ability whilst with Leah and her family and we were very lucky to find her. My Son absolutely adores Leah and her family. It's a very welcoming and relaxed atmosphere with the children always kept busy with lots of different activities. My son has learnt so many new things since he's been with Leah and feel lucky to have found her. Leah is an amazing childminder that is so relaxed and clearly brilliant with children. My daughter loved going there and Leah is always busy with the kids, making sure there is lots going on!